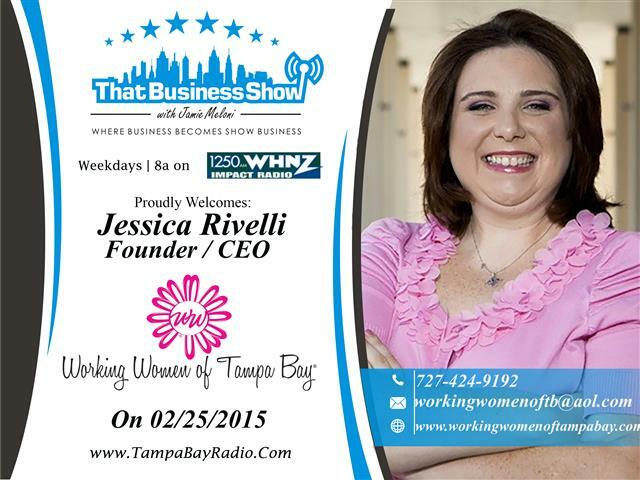 Today was Working Women Wednesdays on That Business Show, a weekly feature sponsored by Jessica Rivelli’s influential networking group, Working Women of Tampa Bay. Learn more about them and how to get involved at http://www.workingwomenoftampabay.com! Jessica opened the show with a brief intro on an event going on today at the St. Petersburg Chamber of Commerce, Iconic Women of St. Petersburg which is being held at the St. Petersburg Coliseum from 9:30 am to 2:00 p.m. today featuring keynote speaker Kate White, former Editor-In-Chief of Cosmopolitan and New York Times Best Selling Author. 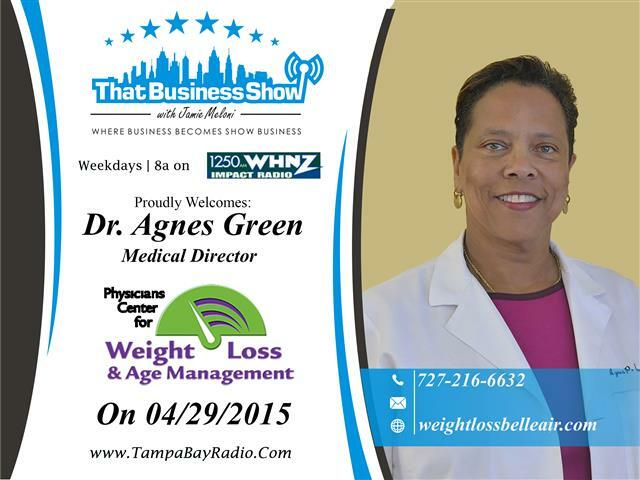 The 2nd guest up on the show today was Dr. Agnes Green, weight loss and age management specialist who runs who her own business in Belleair Bluffs called Physicians Center for Weight Loss and Age Management and located at 232 Indian Rocks Rd N Suite C Belleair Bluffs, FL 33770 and can be reached via phone at 727-216-6632. Dr. Green is a board certified physician trained in family medicine and anesthesiology and has extensive training in the fields of medical weight loss, bio-identical hormone replacement therapy and anti-aging medication. She has also launched her own skin care line called Green MD skincare and more on that product can be found online at www. greenmdskincare.com. Dr. Green and I touched on some of the primary talking points regarding medical weight including HCG diets and the importance of testosterone in men and estradiol in women and how her center works with both men and women needing guidance in these areas. We also touched on her other services including botox and facial therapies. Dr. Green is open for new clients and can be reached through her website at http://www.weightlossbelleair.com or phone at 727-216-6632! 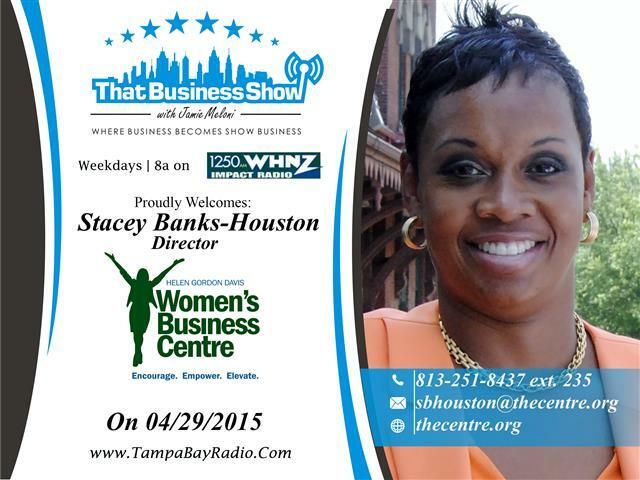 On the 2nd half of the show, I welcomed Stacey Banks-Houston, Director of the Women’s Business Centre, an organization dedicated to empowering women in all areas from parenting and anger management to business development. The segment focused on women entrepreneurs and the programs that women business owners can utilize to grow their existing business or to start a brand new business from scratch. They offer guidance and programs in SBA loan, minority certifications, business plan coaching and much more and women business owners from all ranks of the business environment can benefit from their services. In addition to working with the Women’s Centre, Stacey is also a lifelong entrepreneur and works as a coach and speaker and authored a book called The Passion Plan, Journaling Your Business from Passion to Position to Profit. Inspired by her father’s entrepreneurial spirit, Stacey advises all in business to “Push Your Passion!” Learn more about Stacey and the Women’s Centre at http://www.thecentre.org and via phone at 813-251-8437 X 235 and she is available via email at sbhouston@thecentre.org!